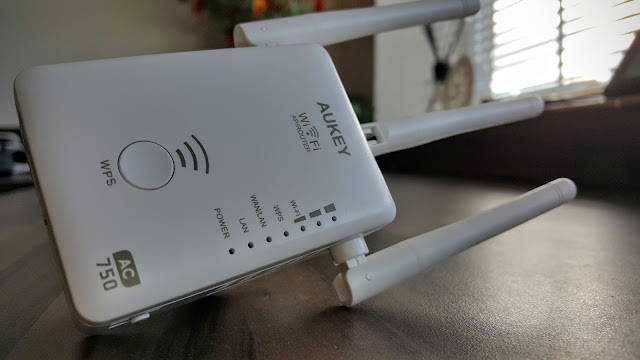 AUKEY WF-R7 is a tiny WiFi repeater with 3 adjustable antenna at the top, on/off switch and router, repeater or APN selection switches at the two sides, status lights and WPS button at the front and 2 ethernet ports at the bottom. 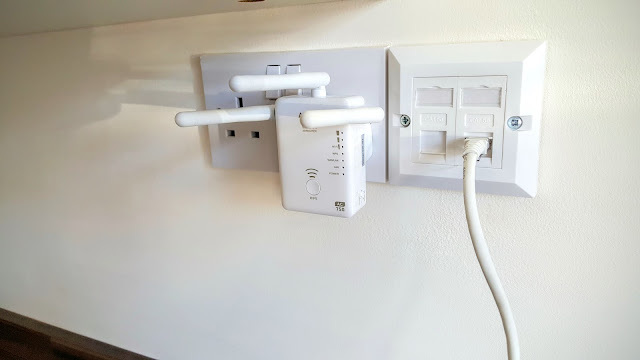 3 Separate antennas caught my attention! I always have troubles in getting Wireless signals across the house and garden due to the thickness in walls and the built structure. Gigabit ethernet is running through out the house, but most of the gadgets at home need solid WiFi, that includes Smart home security systems, wireless Heating & Hot water, WiFi bulbs and Speakers. 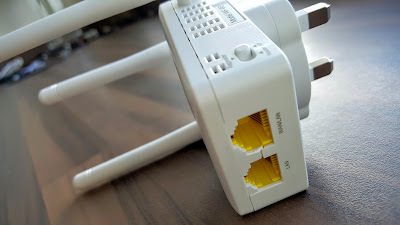 We currently have Virgin Vivid (150mbps) broadband, but the supplied modem-router always has troubles in WiFi range. 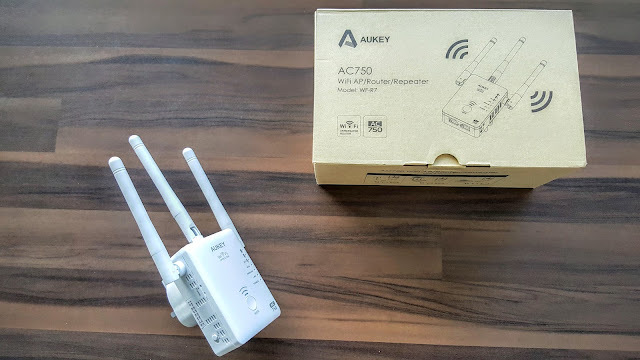 Plugged in AUKEY WF-R7, set the switch to repeater mode and press WPS button on modem & the repeater and in less than 30 seconds, all set up and ready to go (there is also manual option to setup to 2.4 G or 5G. 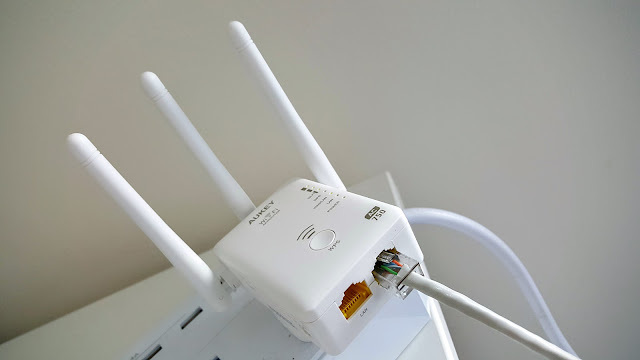 I've noticed a 18% speed drop, but my main requirement is solid connection through out the home. 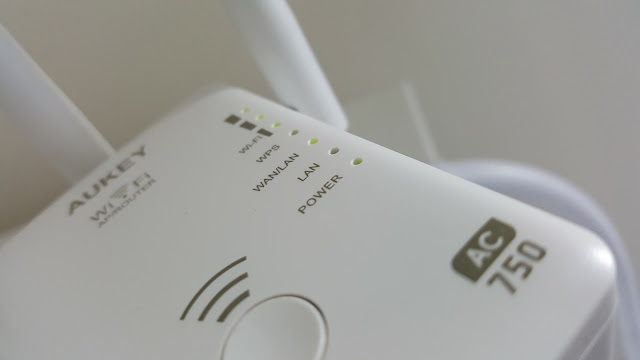 I’ve also tested the AP mode by connecting a CAT 5E cable directly from my modem-router that has 200mbps connection, but due to hardware limitations the WAN - LAN ports only accepts 100mbps connection, resulting the maximum speed of 82mbps (I should get around 150mbps download speed) but upload speeds are unaffected. 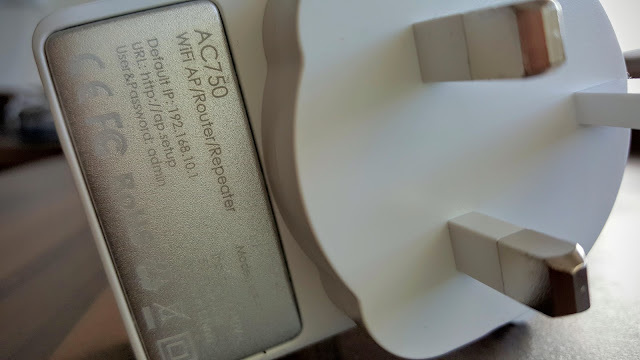 Web interface is self explanatory and easy to use, most of the settings can be managed via Web settings, including future firmware upgrades. Overall a great device, works 100% perfectly in repeater mode and in AP mode your speed is restricted to 100mbps. Please do check out the pictures to see what exactly you get and how it looks.